I've been twice burned by Steripen's Adventurer hydrophoton water purification device, so forgive me if I'm a little less than glowing in my comments. No, the problem wasn't that the light came on when it wasn't supposed to—it was that it never came on at all. The Steripen, in its various incarnations, uses ultraviolet light to kill waterborne pathogens. When all goes well, there seems little doubt the Steripen system is the fastest, easiest, and most effective—no chemical aftertaste or pump worries to boot. As you might suspect, however, these infernal devices have a disturbing tendency to quit on you at particularly inconvenient times. For me, the drill goes something like this: I test my Steripen Adventurer at home to be sure it is working normally. It is. Then, out in the wild, faced with suspect water, the Steripen stubbornly refuses to come alive. So why on Earth did I buy another one? Partly I'm hoping Steripen has revised and improved the design. As Matt notes, Steripens are built to only light when their lamps are submerged in water, ostensibly to protect the user from excessive UV exposure. Low mineral-content water, because of its poor conductivity, can trick the sensor into thinking the lamp isn't submerged. Steripen offers the "Opti" Adventurer model, which uses an optical sensor to (hopefully) circumvent the issue. As for the Freedom, its electrode sensors have far more surface area than the Adventurer's, hopefully as well to prevent sensor malfunction. Assuming it works, I'd have to say the Freedom is the most appealing of all the Steripen models. The Freedom is physically smaller and a full ounce lighter than the older Adventurer model, with an included (but not replaceable!) USB-rechargeable battery, and a far less inscrutable set of operating protocols. Do I trust it? Not really. So carry enough water treatment tablets in your med kit to get you through your hike, if necessary. Specs say the Freedom will treat up to 20 liters of water per full battery charge—not much, but likely good enough for most day and weekend hikes. 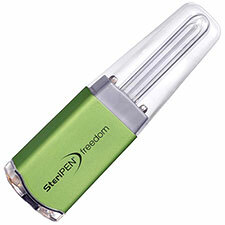 You can get a solar charger from Steripen, which should extend your range if needed. Cloudy or discolored water reduces treatment effectiveness, so know your sources—and don't forget those backup tablets.